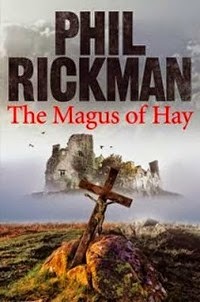 The Magus of Hay is the twelfth mystery in Phil Rickman's Merrily Watkins series, which consists of supernaturally-tinged crime novels featuring an Anglican vicar and Deliverance (ie exorcism) consultant as their main character. In case you're wondering, yes, the Church of England does have priests who are trained exorcists - and the sorts of situations in which Merrily is called in to help are generally fairly plausible; think people who feel there is an unsettling atmosphere in their house after a violent death, for example, rather than children with spinning heads. I've read all eleven of the previous books in the series over the past fifteen or so years, which is an obvious indication of how much I've enjoyed them. They feature an ever-expanding cast of recurring characters, including Merrily daughter Jane, local musician Lol Robinson, West Mercia Police officer DI Francis Bliss, and many more. Rickman has a gift for cliffhanger chapter endings and also for capturing a strong sense of place - the books are as much about the psychogeography of the English-Welsh border country as anything else. The supernatural elements are cleverly woven into the crime plots, and are chilling without pulling the novels into actual horror or fantasy territory. All in all, a great series if you're looking for easy but involving page-turners with plenty of atmosphere. I often save the latest Merrily Watkins for my summer holiday - they're very much that kind of book for me. Now I've said all that, I'm going to be honest and say that this latest instalment in the series disappointed me. Two of the major characters from the previous books are almost entirely absent, and although Merrily is obviously heavily featured, she doesn't play an awfully central role in the plot. She's part of the story, but rarely, if ever, the driver for it. Instead, that task falls to DI Bliss (who seems to have more pages to himself in each new book) and to Betty and Robin Thorogood, a pagan couple who also first came to our attention in A Crown of Lights. While I find Frannie Bliss an engaging lead, there is something lacking for me in Robin and Betty - particularly Robin, an American artist best known for designing fantasy book covers who has decided to rebuild his life with Betty by opening a pagan bookshop in Hay-on-Wye. I don't find him to be a sufficiently well-rounded character to carry a novel to this extent, and his combination of outward brash bluster and inward anxious angst quickly becomes tiresome. I enjoyed Hay-on-Wye, a town I know relatively well, being the primary setting for the action, and as always, Rickman captures every location perfectly. The book even comes complete with 'off-camera' appearances by Richard Booth, the self-styled King of Hay who played a major role in reinventing the town as a haven for book-lovers and an isolated hub of independence from corporate developers and chain stores. The uniqueness of Hay and the question of whether or not it can continue to sustain itself is discussed intelligently throughout, and plays an important part in the story. However, the actual nuts and bolts of the main plot didn't seem particularly fulfilling to me. I didn't get the usual chilling fascination from the supernatural or occult elements in Rickman's other works, and nor did the progress of the investigation really gel. I found the lengthy conversations about the particular type of occultism that features in this book a little dull, if anything - this is a reaction I've never experienced when reading the previous Merrily Watkins books. It's certainly fair to say that my expectations were high, so I may be judging it more harshly than some would, but this was the only Merrily Watkins book I had to remind myself to keep reading so that I could finish it. There were great elements to it, and I still got plenty of enjoyment from it, but there just seemed to be a lot missing. There is a minor sub-plot involving a prim headmistress apparently haunted by the ghost of her partner, and the gay vicar who covers Merrily's parish responsibilities during her week's holiday: I actually found this far more interesting than the main mystery, and would happily have read a whole novel devoted to it. I got the feeling from The Magus of Hay and its predecessor The Secrets of Pain that Phil Rickman might be trying to change the direction of the series to make it less Merrily-centric and focus less on her and her relationships. I may have this completely wrong, of course - I hope I do, because it's not just Merrily but also the people around her (including Jane and Lol) who form the glue that holds these books together. Couldn't agree more! I was very disappointed with Magus, found the main plot line tedious and unbelievable - the virtue of other Merrily books is you believe in her world - and I missed Jane, Eiron, Gomer et al. I hope the next one focuses on Ledwardine and the people we've come to know and enjoy. Even Bull-Davies!